Growing up in the Hudson Valley, apple and pumpkin picking are annual traditions that I look forward to and hold a nostalgic place in my heart. Admittedly, it has gotten more difficult over the years to find the time to go back. I have learned that it a thousand times more relaxing to go when no one is around so I try to go mid-day during the week. Over the last four years, it has become a new tradition to take my younger sister with me. We pick as many apples as we can physically carry, eating a few along the way. We stop on our way out to get honey sticks & cider donuts. Being that most of my time is spent in the city, I have learned to be grateful for simple moments like these. Maskers Orchards in Warwick, New York is where we normally go. I particularly like that they give you a map of the orchard outlining where all of the varieties of apples can be found. There are only fourteen varieties grown there but it’s amazingly enough. They have 2,500 apple varieties in the U.S. My favorite is the Sparta Macintosh which can be picked in late September. It's darker in color than a regular Macintosh and has more sweetness to it. As the saying goes, eating an apple a day is actually very good for you, Apples are extremely rich in important antioxidants, and dietary fiber. To maximize the nutrients, you must eat the peel. I cut apples for snacks or as toppings for salads but often find that they brown quickly. Because apples are high in iron, oxygen is released once a cut is made. An enzyme called polyphenol then reacts causing iron oxide to form which gives you that unappealing brown color. Use a sharp blade when cutting. A sharp blade causes less cellular damage and slows down the browning process. Brush or dip sliced apples in fruit juice. Any fruit juice containing citric acid will slow the enzymatic reaction. I like to use lemon. 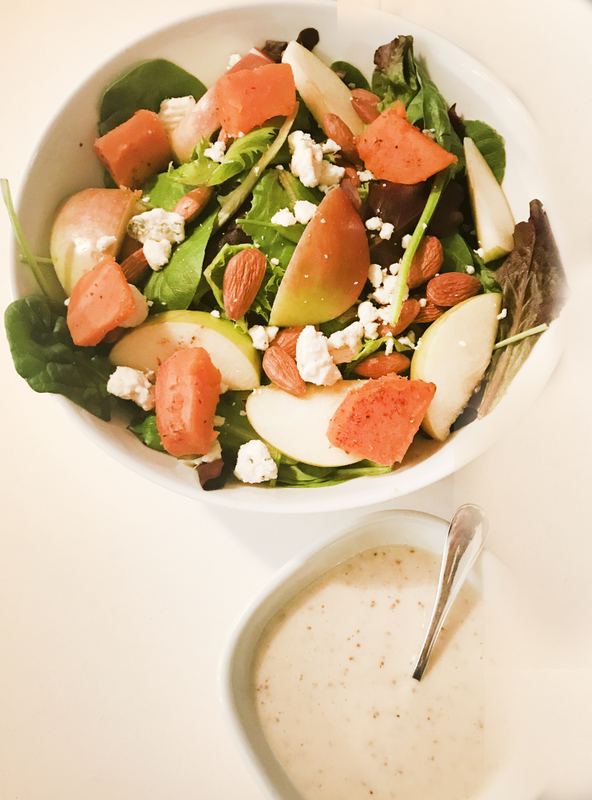 Here is a recipe for a creamy apple vinaigrette. Serve with mixed greens, sweet potato, pecans, apple slices, and blue cheese for an easy lunch! Directions: Combine first eight ingredients in food processor or blender and pulse until smooth. Slowly add in olive oil until fully emulsified. Check and adjust seasoning as needed. Store in air-tight dressing shaker. Will stay fresh for up to five days.